This is Philipp Brandl, igneous petrologist onboard the Joides Resolution (JR). I was born and raised in Germany but I am now based in Australia to do some research drilling south of Japan; awesome. My colleague Frank already blogged about our transit from Yokohama to a place we call ‘IBM-1’, where we will now start to drill site U1438. IBM stands for Izu-Bonin-Mariana and is the name of the volcanic islands chains related to subduction zones in the western Pacific. We arrived at IBM-1 yesterday morning at 04:00 local time and spent the whole day assembling the drill string and lowering it to the seafloor in more than 4700 m water depth. That’s are almost 3 miles of water! Last night, we all watched the moment when the moon pool was opened to deploy the VIT (vibration isolated television) color camera along the drill string. This camera allows us to survey the seafloor for submarine cables or to re-entry a hole. No one wants to imagine what would happen if we accidently drill trough a fiber optic cable connecting these parts of the world. Once we have finished this survey we will soon start to drill our first two holes U1438A and B using APC drilling techniques. 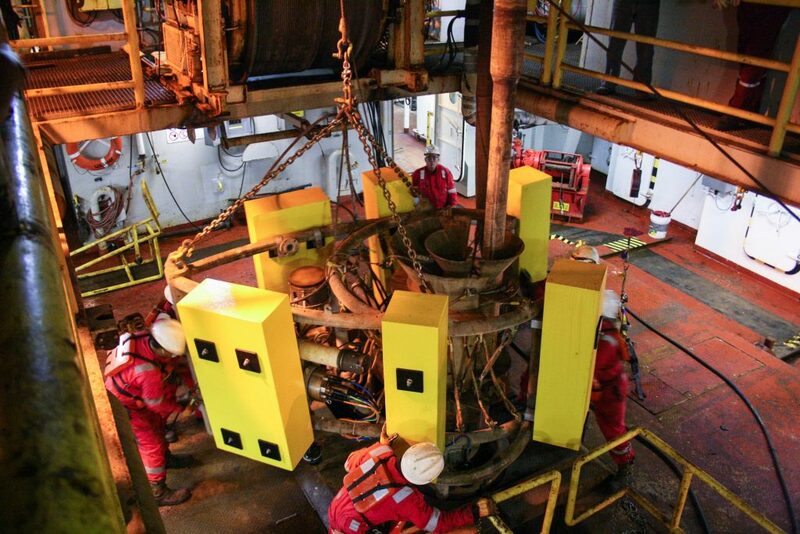 APC stands for advanced piston corer and means that we will shoot a core into the seafloor using high pressure. So by tomorrow morning we are expecting the first ‘core on deck’ … Stay tuned! If you know the answer email it to jrs_prosalik@ship.iodp.tamu.edu or jrs_jbogus@ship.iodp.tamu.edu for a chance to win a free JOIDES Resolutuion mug or T-shirt.